I was welcomed aboard the plane and headed down the aisle. This plane would be going out packed – mainly because Oktoberfest had kicked off. Blue and Yellow on the outside. Blue and Silver on the inside. And we all know Brits and Beer go together, don’t we? With hen parties abroad and people getting settled, I headed to my seat near the back of the plane. The row was empty when I got there, but by the time I stowed my luggage and got comfy… more people arrived. I strapped in and got comfy with my surroundings. After some years, I’ve got used to the Lufthansa NEK seat (or a Recaro custom product), and compared to some of the previous generation slimline seats, it’s still pretty passable – with good legroom and living space. Even in the back of the plane, where space can be at a premium. The Lufthansa NEK/Recaro Seat – Tight, but a reasonable amount of space. Safety first. Always read and understand the safety card. Loading was completed on schedule, and after a manual safety demonstration, our plane pushed back and begun a short trundle around Heathrow Airport to 27L. Etihad Airbus A380 powering off. British Airways Boeing 787… without the engines. So, how many planes do you think you can line up for departures on a Heathrow runway? If your answer was less than 2, you’re wrong. Four planes at once were turning and waiting their turn to depart – a well-coordinated piece of work by Ground control. Count the tail – four planes line up including the one I was on (including the rusty pigeon). With a roar, our engines powered up and LH2473 took to the sky. It was shortly after the point I were airborne that my body decided that an hours snooze was in order. Which was inconvenient because I wanted a non-stop sandwich. I did wake up in time for the drinks service. In the past – one could get a can of mini-coke when requesting a coke light. That’s changed now… and you get served from the same bottle as everyone else. A nice cost-cut/save the world/nonstop change by Lufthansa there. I wasn’t in the mood to chase after a sandwich, so I dozed on and off as the plane continued to cross Western Europe. Prices were reasonable for the short-haul service, with €3 for messaging, €7 for a browse package and €12 for a package that unlocks the full bandwidth of the system. With only a 1 hour 30 segment, and me sleeping on and off it, it made no sense to connect to the platform. 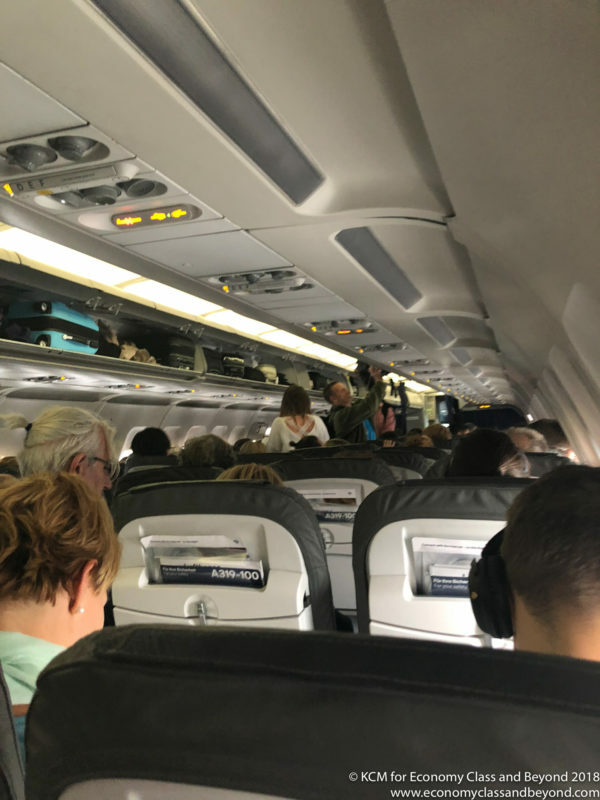 Least of all, on the next flight (the flying lab) I would be more connected that I would normally like to be. All too soon, our LH2473 began its descent into the Munich Area, vectoring in with more than a few bumps as it dropped through the cloud layers. With ease, the Airbus A319 landed at its base of Munich Airport, ending LH2473’s flight. As the plane was on the ground, it begun the taxi from the runway to the T2 Satellite. Because everyone loves a Queen. Turning to the gate with other narrow body aircraft, the plane came to a stop. With that, the seat belt signs were released with the mass hysteria of people wanting to be first off the plane. Overall: A pretty standard end-to-end flight, with a simple up and down the flight, with some snacks and drinks (even though I missed the snacks). the seats were ok for the short hop, and the crew did what they needed to do in a Business-friendly sort of way. All opinions and thoughts are the author’s own, and are not directed by Recaro Aircraft Seating, Lufthansa Systems, APEX or Aircraft Interiors Expo. The video is a 27L departure.